Geography, Seattle, USA. Art Jewellery Forum’s first exhibition of contemporary jewellery was a featured show at the 40th annual SNAG conference in Washington. Featuring the work represented by 30 international galleries. 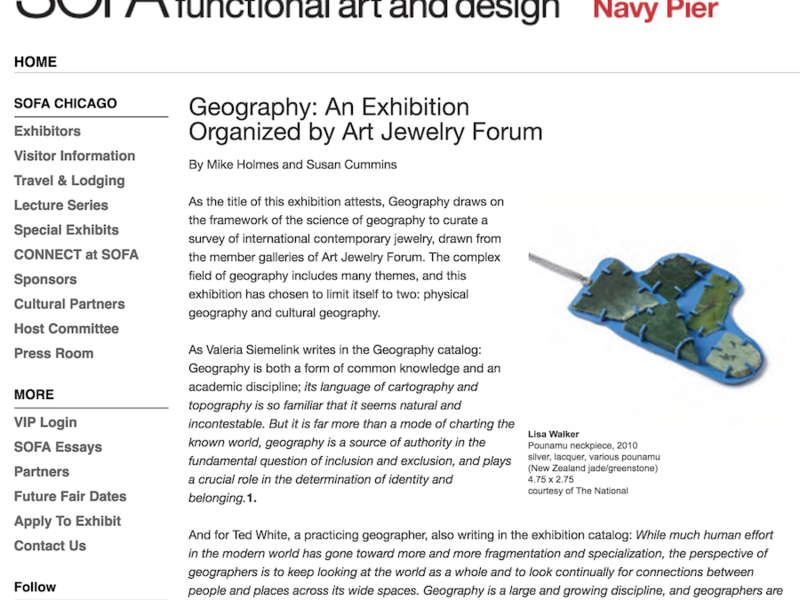 The pieces by 53 artists featured in Geography reflect the global nature of the contemporary jewellery field and the different ways jewellers react to their environment. Some of the jewellery relates to other cultures, gone or drastically changed, and demonstrates that ideas of place are constantly changing. The exhibition is a celebration of the amazing variety of the natural world and humanity’s part in it, and proves that contemporary jewellery continues to have a singular ability to construct culture and place even in a rapidly changing and increasingly interconnected world.